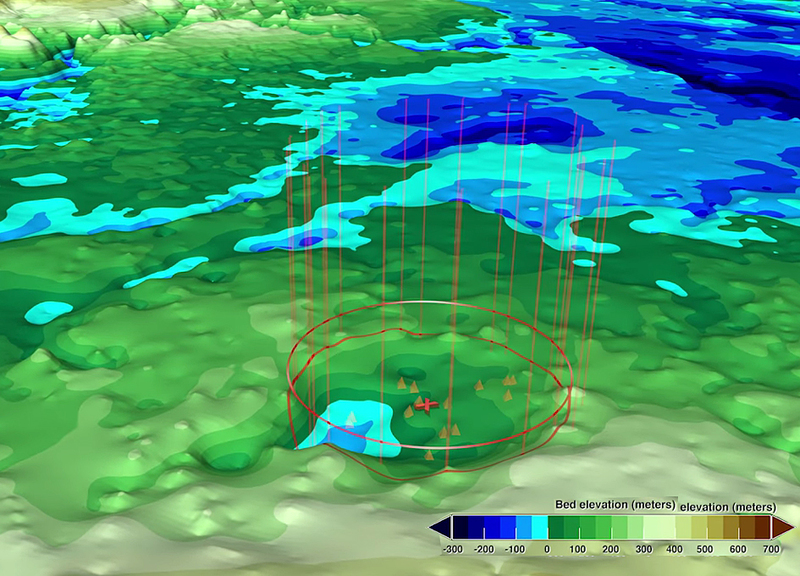 This follows the finding, announced in November 2018, of a 19-mile-wide crater beneath Hiawatha Glacier -- the first meteorite impact crater ever discovered under Earth's ice sheets. Though the newly found impact sites in northwest Greenland are only 114 miles apart, at present they do not appear to have formed at the same time according to the new study, published in AGU's journal Geophysical Research Letters. "We've surveyed the Earth in many different ways, from land, air and space -- it's exciting that discoveries like these are still possible," said Joe MacGregor, a glaciologist with NASA's Goddard Space Flight Center in Greenbelt, Maryland, who participated in both findings. "I began asking myself 'Is this another impact crater? Do the underlying data support that idea?,'" MacGregor said. "Helping identify one large impact crater beneath the ice was already very exciting, but now it looked like there could be two of them." Although the newly found impact craters in northwest Greenland are only 114 miles apart, they do not appear to have been formed at the same time. From the same radar data and ice cores that had been collected nearby, MacGregor and his colleagues determined that the ice in the area was at least 79,000 years old. The layers of ice were smooth, suggesting the ice hadn't been strongly disturbed during that time. This meant that either the impact happened more than 79,000 years ago or -- if it took place more recently- any impact-disturbed ice had long ago flowed out of the area and been replaced by ice from farther inland. The researchers then looked at rates of erosion: they calculated that a crater of that size would have initially been more half a mile deep between its rim and floor, which is an order of magnitude greater than its present depth. Taking into account a range of plausible erosion rates, they calculated that it would have taken anywhere between roughly a hundred thousand years and a hundred million years for the ice to erode the crater to its current shape -- the faster the erosion rate, the younger the crater would be within the plausible range, and vice versa. Reference: "A Second Large Subglacial Impact Crater in Northwest Greenland?" Joseph A. MacGregor: Cryospheric Sciences Laboratory, NASA Goddard Space Flight Center, Greenbelt, Maryland, USA; William F. Bottke Jr.: Dept. of Space Studies, Southwest Research Institute, Boulder, Colorado, USA; Mark A. Fahnestock: Geophysical Institute, University of Alaska Fairbanks, Fairbanks, Alaska, USA; Jeremy P. Harbeck: Cryospheric Sciences Laboratory, NASA Goddard Space Flight Center, Greenbelt, Maryland, USA; and ADNET Systems Inc., Lanham, Maryland, USA; Kurt H. Kjær: Centre for GeoGenetics, Natural History Museum, University of Copenhagen, Copenhagen, Denmark; John D. Paden: Center for Remote Sensing of Ice Sheets, The University of Kansas, Lawrence, Kansas, USA; David E. Stillman: Dept. of Space Studies, Southwest Research Institute, Boulder, Colorado, USA; Michael Studinger: Cryospheric Sciences Laboratory, NASA Goddard Space Flight Center, Greenbelt, Maryland, USA; 2019 Feb. 11, Geophysical Research Letters [https://agupubs.onlinelibrary.wiley.com/doi/10.1029/2018GL078126].